Great color-changing lighted prop for inside or outside! Add some color-changing fright to your haunt! This prop is made of hard plastic, changes colors and can be buried with the included ground stakes for an eerie effect! Multi-color changing lights fade in and out for a spooky effect. Includes 5 plastic body parts connected by a power wire (1 head, 2 hands and 2 partial feet). All 5 body parts change color and fade from one color to the next. That perfect little something for your graveyard display! 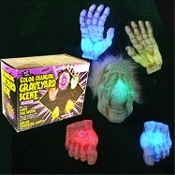 Luke the Spook is a color changing set that includes head, two hands and two feet. Wire connects each piece so you can spread his parts out. Cover wiring with leaves or mulch so they disappear. Battery-operated, so displays anywhere! -Requiress 3 - ''AA'' batteries (not included). -Includes 4 - 6-inch long plastic stakes. Bury prop in the ground for a scary effect! -Can be used as part of a graveyard scene! -All 5 body parts gradually change color and fade from one color to the next. Easy decorating for doorways, archways, wreaths, tabletops and centerpieces. Decorate the front of house, porch, lamp post, bushes and trees! Individual body parts sizes vary from 6 - 10-inches each.